How is American policy toward the Arab-Israel dispute made, and who makes it? Steven Spiegel, professor of political science at the University of California at Los Angeles, focuses on these questions in his excellent and important study, The Other Arab-Israeli Conflict. To begin with the first question, Spiegel shows that each of the presidents since World War II has followed a highly idiosyncratic approach to the Middle East. Harry S Truman had no goals of his own, but dealt with problems as they arose. He took advice from disparate quarters, including even his former haberdashery partner. Despite a pro-Israel reputation, he is fact favored the Arabs one time, Israel the next. "The president swayed back and forth as internal and external constraints affected him. The outcome was a weak and inconsistent policy, which neither side could totally influence." Dwight D. Eisenhower replaced this chaos with a highly structured, military-type chain of command. Disliking competition over foreign policy, he eliminated non-governmental influences. Within the government, Eisenhower and his aides shared a consistent view of American interests in the Middle East, one that favored closer relations with the Arabs. Oblivious to the causes of the Arab-Israel dispute, they ignored its underlying issues; the result was "a program coherent in its global, regional, and local objectives, but rigid in formulation and content." When it eventually became clear that this "grandiose and comprehensive strategy" had failed, the administration lost interest in the Middle East. John F. Kennedy considered the Eisenhower decision-making process deadening. Instead, he "institutionalized the conflict in the White House state," having advocates of pro-Israel and pro-Arab points of view argue their positions in memoranda and in person. Lyndon B. Johnson approached the Middle East somewhat like Truman. Acting passively, without a strategy, he responded to crises in an ad hoc manner. Pro-Arab and pro-Israel factions, pressured the president relentlessly and "Johnson found it harder than most presidents to resolve the two strains and therefore adopted both to the confusion of all involved parties." As a result, "passivity, avoidance, and lack of imagination" characterized Johnson and his aides. In Richard M. Nixon's first term, two top officials, the Secretary of State and the National Security Adviser, "engaged in an unprecedented and prolonged controversy over Middle East issues." Despite Nixon's usual decisiveness in foreign policy, he could not make up his mind when it came to the Middle East. "Middle East policy during the first term was thus conducted with a marked lack of coherence, in contrast to other issues that went through the orderly Nixon decision-making apparatus." Nixon's National Security Adviser, Henry Kissinger, became Secretary of State in the Nixon-Ford administration and dominated Middle East policy so completely that government debate on the Arab-Israel issue ground to a virtual halt. Kissinger pursued a highly personal and complex strategy in the Middle East that at times even excluded the president. The consistent pro-Arab outlook of Jimmy Carter's administration is termed by Spiegel an "astounding philosophical consensus." The president and his advisers were fully agreed on the need to solve the Palestinian question, to bring the Soviet Union into diplomatic activities, and to win Saudi help. Near-unanimity encouraged this administration to stick rigidly to its preconceptions, thus ignoring both public opinion and developments in the Middle East itself. Ronald Reagan's first three years, finally, were marked by "a distinct philosophical perspective, formulated by a passive and even uninvolved chief executive who was surrounded by competing and frequently changing players." The president set general guidelines which he expected aides to implement. Although they disagreed markedly on Middle East issues, he let their arguments run on. The administration was characterized by its "inconsistency and divided voice." The president's peculiar approach to the Middle East—"a combination of emotion, ideology, lack of knowledge, and instinctive political acumen"—resulted in an especially amorphous policy. Even this brief survey points up the special decision-making problems involved in Middle East policy. 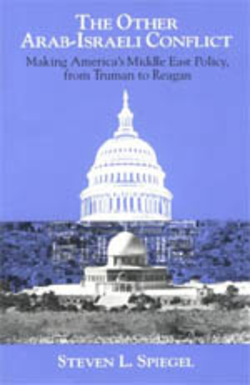 Virtually every recent president found it unmanageable: Truman and Johnson let themselves be buffeted by events; Eisenhower and Carter tried to impose order but failed; Nixon-I found it one region he could not treat systematically, while Nixon-II and Ford gave the region over to their chief aide; and Reagan allowed anarchy. It is tempting to blame Arabs and Israelis for this state of affairs, to shake one's head and grumble about their intransigence; but surely this is inadequate. Relations between the two Koreas are at least as hostile as relations in the Middle East, yet in Korea that hostility serves to clarify issues rather than the reverse. The dilemma of Arab-Israel policy is a function instead of the unique debate about it that takes place in the United States. The Middle East alone falls outside the central foreign-policy issue of our time, the question of how to deal with the Soviet challenge. Elsewhere around the globe, American conservatives and liberals argue over the same set of issues; the utility of force, Soviet responsibility for local problems, and the like. If you know an American's view on the U.S.S.R., you can pretty well predict his opinions on Central America, Western Europe, Southern Africa, or East Asia. But not on the Middle East. Homeland of monotheism and site of the world's greatest oil reserves, the region has a special place in American politics. When it comes to the Middle East, religious passions and financial interests overwhelm the usual right/left divisions in favor of an entirely different dichotomy, the pro-Arab and the pro-Israel. Neither conservatives nor liberals consistently favor the one side or the other. All four possible combinations - pro-Arab conservatives, pro-Israel conservatives, pro-Arab liberals, pro-Israel liberals - are active in American politics. Pro-Arab conservatives stress the importance of oil and business ties; pro-Israel conservatives note Israel's usefulness as a strategic ally against the Soviet Union. Liberals friendly to the Arabs emphasize the suffering of the Palestinians; liberals friendly to Israel stress Israel's democracy and its high moral standards. These divisions bedevil government decision-making, as Spiegel shows. Although voters select a president with, in foreign affairs, an eye primarily toward East-West issues, and although a president chooses his aides on the same basis, an administration's Soviet policy is no key to its views on the Middle East. Eisenhower was a cold warrior while Carter sought conciliation with Moscow, but both favored the Arabs. Eisenhower and Nixon both made anti-Communism the central tenet of their foreign policy, but one favored the Arabs and the other Israel. Top advisers are equally idiosyncratic. As Spiegel notes, William Rogers and Henry Kissinger agreed on the Soviet Union but not on the Middle East; conversely, Cyrus Vance and Zbigniew Brzezinski fought over Soviet policy but agreed on the Arab-Israel dispute. Though there are no fixed rules, members of the cabinet dealing with foreign issues, from Dean Acheson to Cyrus Vance, have generally favored the pro-Arab viewpoint; White House officials, from Clark Clifford to Walter Mondale, have leaned toward Israel. How much attention the president pays to the Middle East affects the feuding among his advisers. The more deeply a president involves himself, the more faithfully his staff sticks to his line, and consistency follows. Eisenhower and Carter saw the Arab-Israel conflict as central to their concerns, and therefore presided over the most cohesive policies. Conversely, Truman, Kennedy, and Johnson absented themselves somewhat, and the result was haphazard decision-making. This brings us to the second question: who makes decisions? Spiegel offers a daring hypothesis: U.S. policy reflects "the basic assumptions of the president, the individuals on whom he relies for advice, and the resulting decision-making system which converts ideas into policies." Presidents, in particular, have a decisive role, for they establish the goals, pick the players, and make the final decisions. Moreover, Spiegel argues, in most cases they take steps in accordance with their consciences and "generally for reasons of state, largely unrelated to domestic politics and often in defiance of domestic groups." In other words, "the principal policy-makers and their ideas," and these alone, are what count. With one blow Spiegel thus dispenses with voters, State and Defense Department bureaucrats, lobbyists, businessmen, journalists, intellectuals, and scholars. Congress he deems "largely irrelevant" to the peace process. As for interest groups and bureaucrats, they can delay or accelerate decisions, but they cannot affect their substance. They "limit policy; they do not define it." But does Spiegel's paradigm adequately explain American decisions concerning the Middle East? Notwithstanding my respect for his command of the subject, this thesis seems to me inadequate. The elements Spiegel relegates to the sidelines do more than create the framework in which officials act; they also stimulate the officials and provide incentives for them. To begin with, as even Spiegel acknowledges, domestic pressure groups do affect Middle East policy when the president chooses not to be actively involved. "If the [Arab-Israel] issue is given low priority, presidential attention will be minimal and the influence of the bureaucracy, Congress, and interest groups will increase." The administrations of Truman, Johnson, and Reagan exemplify this situation. Second, the pro-Israel vote should not be underestimated. It is highly mobilized and shapes the Middle East planks of both congressional and presidential candidates; it can even influence the outcome of elections. While campaign promises are, of course, broken, they usually do indicate basic intent. Moreover, the pro-Israel vote can affect the composition of the presidential elite. George W. Ball might well have been appointed secretary of state if not for his extreme hostility to Israel; Senator John G. Tower of Texas took care to become more friendly to Israel when positioning himself (unsuccessfully) as a candidate for secretary of defense in late 1984. Third, the bias of Foreign Service Officers against Israel does more than delay or accelerate decisions; it dominates a secretary of state like William Rogers who enters office inexperienced in foreign affairs and without developed views on the Arabs and Israel. Henry Kissinger and Alexander Haig are probably the only secretaries not to have been affected in this manner. Fourth, as Steven Emerson demonstrated in his investigation of petrodollar influence in Washington, The American House of Saud, business interests can shape U.S. policy in the Middle East. An example was the passage of the AWACS package in 1981, a decision fraught with potential effects on warfare between the Arabs and Israel. Fifth, the fact that the Arab-Israel conflict falls outside the conservative/liberal debate enhances the importance of bureaucrats and interest groups. Since the political parties lack personnel trained in Middle East affairs, more key positions are held by bureaucrats, who exert more influence. Interest groups also gain, for the usual ideological stands and coalitions do not apply to the Middle East. Sixth, the presidential elite derives its ideas from the outside. John Maynard Keynes once noted that "practical men, who believe themselves to be quite exempt from any intellectual influences, are usually the slaves of some defunct economist"; a similar pattern holds for Middle East policy. Busy officials do very little original thinking; they derive their goals and their principles from sources outside government. When the intellectual climate changes, as it did after the October 1973 war, politicians must respond. Spiegel, indeed, implies as much in his observation that "battling for the hearts and minds of the American elite has been the true subject of the Arab-Israeli war for Washington." Finally, Spiegel exaggerates the role of Washington. The chapters of this book are arranged by American presidents, where one would expect them to be arranged by decisive events in the Middle East: wars, treaties, changes of regime. Like Strobe Talbott, whose books on arms control portray that process in terms of American factions rather than in terms of relations between the United States and the Soviet Union, Spiegel has allowed himself to become so absorbed by the Washington sideshow that he sometimes neglects the main event. This is in a way understandable. As a professor of political science, Spiegel instinctively compares Middle East policy-making to domestic policy-making. And, in contrast to such matters as labor relations, education, taxation, abortion, and welfare, where immense pressure is felt from constituents, foreign relations must seem an altogether quiet affair, dominated by a relatively few people in the capital. There is some truth to this: every administration finds it has more room to maneuver in the world than in the country. At the same time, within the realm of foreign affairs, the Arab-Israel conflict is one that is uniquely subject to constituent pressures. The presidential elite controls Middle East policy far less than it does policy toward NATO, China, South Africa, or other regions. There have been occasional moments of spectacular success - UN Resolution 242 in 1967, the Kissinger shuttle, the Camp David accords, and the Egypt-Israel peace treaty. Unfulfilled objectives, however, have been the norm: from trusteeship proposals [instead of an independent Israel] to the Baghdad Pact; from the Johnson and Rogers Plans to autonomy [on the West Bank] and the Reagan plan. He might have added to this list the 1953 Johnston plan to share the Jordan River waters, the May 1983 accords between Lebanon and Israel, as well as many other failed initiatives. Spiegel has several explanations for this sorry record. He argues, for one, that Washington is arrogant. "American leaders have consistently assumed that they knew better than other involved statesmen how to provide for peace and security of the region." The dubious notion that the U.S. on its own can resolve the Arab-Israel dispute leads to a persistent unilateralism. Consequently, Washington does not limit itself to responding to events in the Middle East, but devises plans for resolving the Arab-Israel conflict for its own reasons and at the time of its convenience. Each newly elected president since 1953 has floated an Arab-Israel initiative early in his first term: the Johnson plan in 1953, the Dulles plan in 1955, the Johnson plan in 1962, the Rogers plan in 1969, the Carter plan in 1977, and the Reagan plan in 1982. Inspired as they were by American rather than Middle Eastern concerns, all failed completely. American politicians fancy that the sale of arms to Israel permits them to dictate terms. Some administrations "arm Israel to the teeth," hoping this will win political flexibility; others withhold arms in the effort to coerce obedience. The record shows that neither strategy works. Spiegel argues that Israel is flexible only when it can strike a favorable deal, and this depends more on the Arabs than on American arms policies. The U.S. makes similar mistakes with the Arabs. Ignoring the crucial fact that Arab states are too intensely involved in their own disputes to align closely with a superpower, Washington keeps trying to lure Arab leaders into joining anti-Soviet coalitions - the Baghdad Pact, Kennedy's opening to Egypt, the Nixon Doctrine, Haig's strategic consensus - and is invariably disappointed. Spiegel also faults American politicians for dwelling so much on the Arab-Israel conflict. Preoccupation with that dispute has meant slighting other developments in the area, with disastrous consequences. Mu'ammar al-Qadhdhafi received American help to consolidate his power in Libya while our attention was distracted by the war of attrition at the Suez Canal; the falling shah of Iran took a back seat to Camp David; the 1982 gains in Lebanon were frittered away by the Reagan administration's turn to the West Bank issue. Whatever qualifications or criticisms of interpretation one might wish to enter about The Other Arab-Israeli Conflict, it is enormously valuable as a detailed and systematic examination of American policy in the Middle East. Thanks to Steven Spiegel's book, it is now possible to discuss this issue in an educated way.